The students in my Best Selling Novels class read a bunch of books from this Abraham Lincoln Book List that I discussed a few blogs back, and one of the books was this awesome RBG book, and one of my students wrote an amazing review of it that I’d like to feature today. When choosing a book from the Abe Lincoln 2017 list, I wasn’t that conflicted. I like politics and bold, strong-voiced women, therefore I went straight for Notorious RBG. 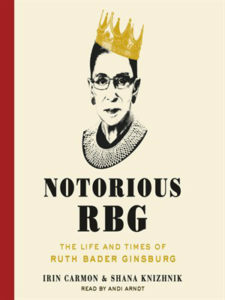 Plus there’s a gold crown on RBG, on the cover and she looks super gangsta. The crown wasn’t even the best part, on the opening page there’s a Warhol-like photo setup of RBG. Artsy and gansta? Yes, please. Honestly, I was a bit nervous to read this, what don’t I already know about my dear Ruth? And will these so called “authors” even provide what I want to see? Scorned by the vague, impersonal and sometimes false biographies I’ve read and ran away from, Irin Carmon and Shana Knizhnik grabbed me back from the cheesy-gut-wrenching romance novel shelf with this book. Carmon and Knizhnik do a superb job when depicting Supreme Justice, Ruth Bader Ginsburg within their collaborative effort, Notorious RBG. Titled, Notorious RBG because Knizhnik had created a Tumblr page under the same name, which is how Carmon then found her and the collaboration began. Carmon, an Isreal-born journalist partnered with Knizhnik, a Philadelphia-born Lawyer and attorney, to write about RBG. This feminist collaboration is important, not just for RGB’s legacy, but for young activists, like me, who read this. They share a personal side of RBG, the sexism in the workplace, personal loss and even her cancer diagnosis. All of these sides to RBG help personify her, not just a quote or robe we see on TV. RBG shouldn’t be seen as just a Supreme Justice or a feminist, even a meme or caricature after reading this, she should just be entirely: Ruth Bader Ginsburg. Notorious RBG is filled with personal pictures from RBG’s childhood and college years and even has stories from RBG herself. Having to read about someone’s life, no matter if you like them or not, can be tedious, but the pictures of baby RBG held my attention. Carmon, who probably became a “Frequent-Flyer” after this book, had interviewed RBG numerous times then had a sit down to read over and fact check everything. Carmon makes mention of this, and it’s a small but important note. This note at least told me, as a reader, that Carmon and Knizhnik didn’t just sit down and Google, “RBG’s favorite color,” it actually has the RBG nod of approval. This book is thorough and precise. It gets into RBG’s life without crossing any lines. We see a timeline at the beginning of the book, starting at the 19th century women’s rights movement, then lead into the birth of RBG, followed by how she was one of nine women within her Harvard Law class. This timeline allows for a visual aid for what’s to come throughout the book. I thought it was a helpful and creative idea because it acted as a guide. I used that timeline when I got lost among the cases RBG worked on, the elections she was involved in and her personal stories. Carmon and Knizhnik capture RBG’s triumphs and trials throughout. The triumphs being her overcoming sexism and becoming a trailblazer for women of law and of the world, the trials being her diagnosis of cancer yet never missing a day from her seat at the Supreme Court. Carmon and Knizhnik kept humor throughout, the title being an homeage to Notorious B.I.G., the titles of his songs, then partnered with a political cartoon here and there. The authors went for every aspect of her life which is important in a biography. This book hid nothing in the most respectful of ways. RBG allowed for the gates to be put down and that’s important. It’s important to see that she got a tumor removed and only 18 days later was back to the bench. Carmon and Knizhnik didn’t praise or focus on the surgery or RBG’s recovery, they made sure to move on, as RBG did, and speak about what she worked on next to better the justice and legal system. (I can spoil the ending because it’s a true story) The biography ends uniquely and with heart, with Ruth Bader Ginsburg’s husband’s recipe for “Pork Loin Braised in Milk,” while I can’t eat pork, I do appreciate it. It is an odd ending that Carmon and Knizhnik decided to take. They get factual and serious, then sad and inspired, then suddenly there’s “RBG’s Favorite Marty Ginsburg Recipe.” It’s an element that’s important, not to RBG’s law and Justice career, but who she is as a person. Carmon and Knizhnik ground “Supreme Justice, Ruth Bader Ginsburg” from the praise and pioneering that they speak of, to just Ruth. Thank you, Alexis for such a dope review!